The Index opened flat but saw huge liquidation from the onset to close the expiry around the lows of the day at 8111.75, huge loss of 59.45 points. The broader market was negative, with 612 advances to 873 declines. The range at the start of the series is at 8000-8500. Call option 7900-8800 added huge 37.81 lacs OI. Put option 8500-7500 added huge 31.74 lacs OI. 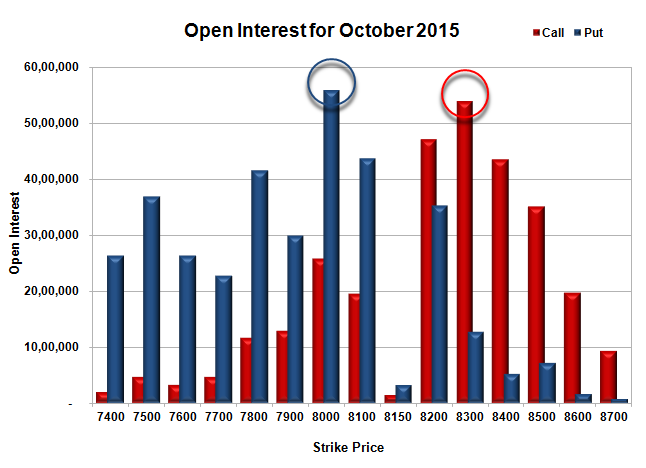 Nifty Open Interest is at 1,78,30,125 up by 42,06,375, with decrease in price, 100% roll-over with huge short build-up. 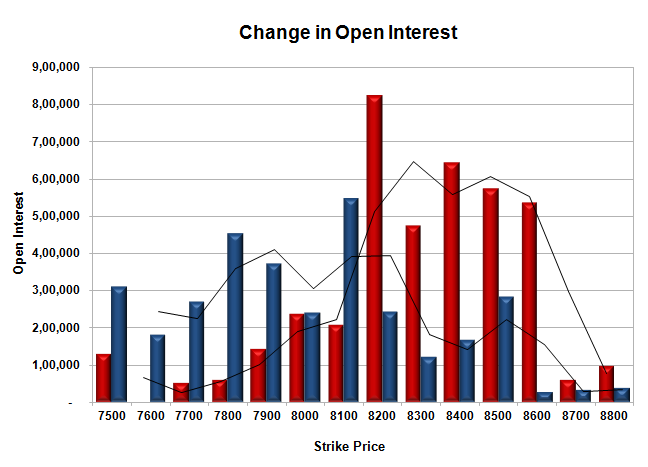 Bank Nifty Open Interest is at 21,90,750 up by 7,50,060, with decrease in price, 100% roll-over with huge short build-up. FII’s sold 3.88 lacs Futures, which includes 264257 contracts long liquidation and 209565 contracts short covering, with decrease in net OI by 473822 contracts, includes 153407 longs to 168939 shorts for the day. FII’s Index future open contract as on date is 194257 Longs to 92142 Shorts, Net Long 102115 down by huge 54692 contracts. 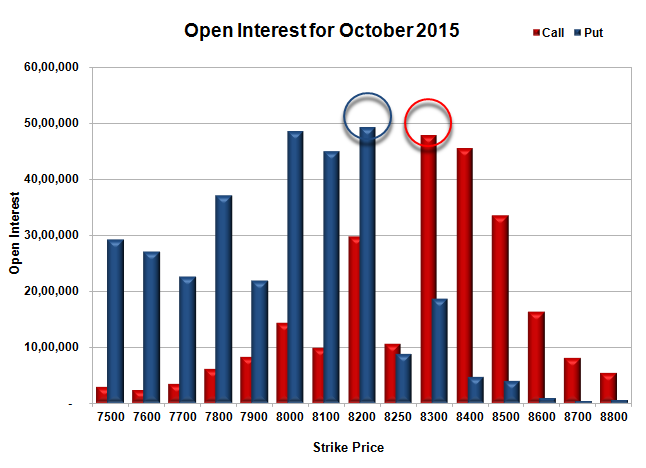 Initial support at 8100, with OI of 20.78 lacs and below that at 8000 with OI of 26.67 lacs. Initial resistance at 8200, with OI of 17.53 lacs and above that at 8300 with OI of 20.07 lacs. Day Range as per Option Table is 8066 - 8185 and as per VIX is 8037 - 8186 with 8130 as the Pivot. The Index opened weak below the psychological level of 8200 and stayed weak for the entire session of trade but closed a few points away from the lows at 8171.20, huge loss of 61.70 points. The broader market was negative, with 618 advances to 874 declines. The range for the Expiry is at 8100-8300. Call option 8150-8300 added huge 19.50 lacs OI with profit booking at 8400 and above strike prices. Put option 8150 added 9.12 lacs OI with short covering at 8200 and above strike prices. Nifty Open Interest is at 1,06,95,775 down by 44,35,700, whereas Nov series added 32.66 lacs OI with decrease in price, mostly roll-over with huge long liquidation. Bank Nifty Open Interest is at 13,26,550 down by 3,25,850, whereas Nov series added 7.09 lacs OI with decrease in price, 100% roll-over with huge short build-up. FII’s sold HUGE 28.73 lacs Futures, which includes 125191 contracts long liquidation and 10252 contracts short covering, with decrease in net OI by 135443 contracts includes 187170 longs to 302109 shorts for the day. FII’s Index future open contract as on date is 458514 Longs to 301707 Shorts, Net Long 156807 down by huge 114939 contracts. 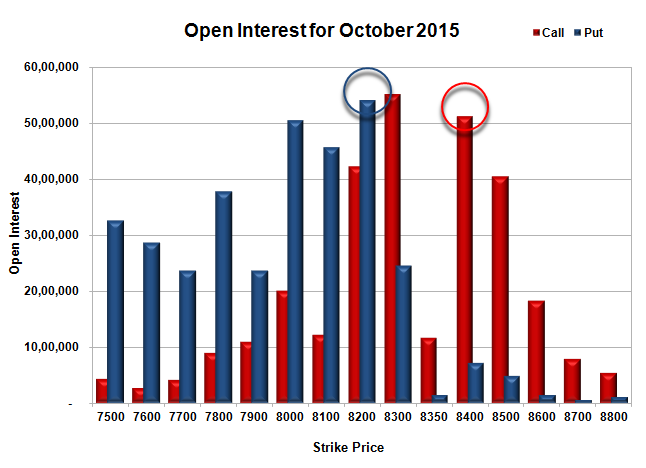 Initial support at 8150, with huge OI addition of 9.12 lacs and below that at 8100 with OI of 43.60 lacs. 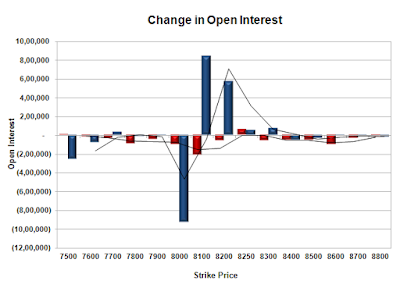 Initial resistance at 8200, with OI of 37.79 lacs and above that at 8300 with highest OI of 53.54 lacs. Day Range as per Option Table is 8113 - 8231 and as per VIX is 8098 - 8244 with 8171 as the Pivot. The Index opened gap-up at 8334 but saw huge profit booking from the onset and closed near the lows of the day at 8260.55, loss of 34.90 points. The broader market was negative, with 504 advances to 1026 declines. The range for the Expiry weeks stays at 8100-8400. Call option 8250 added 1.89 lacs OI with profit booking seen at 8300 and above strike prices. Put option 8200-8100 added 5.03 lacs OI with profit booking seen at 8000 and below strike prices. 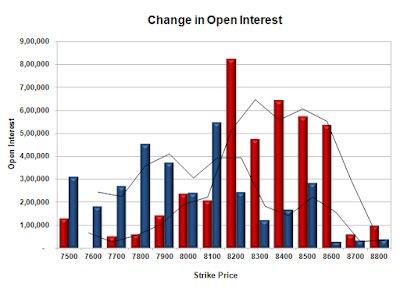 Nifty Open Interest is at 1,68,83,450 down by 16,43,575, whereas Nov series added 17.76 lacs OI with decrease in price, 100% roll-over with small short long build-up. Bank Nifty Open Interest is at 19,25,950 down by 1,59,300, whereas Nov series added 1.03 lacs OI with decrease in price, mostly roll-over with huge long liquidation. FII’s bought huge 11.54 lacs Futures, which includes 7499 contracts long liquidation and 53655 contracts short covering, with decrease in net OI by 61154 contracts includes 151780 longs to 105624 shorts for the day. FII’s Index future open contract as on date is 612890 Longs to 336379 Shorts, Net Long 276511 up by huge 46156 contracts. 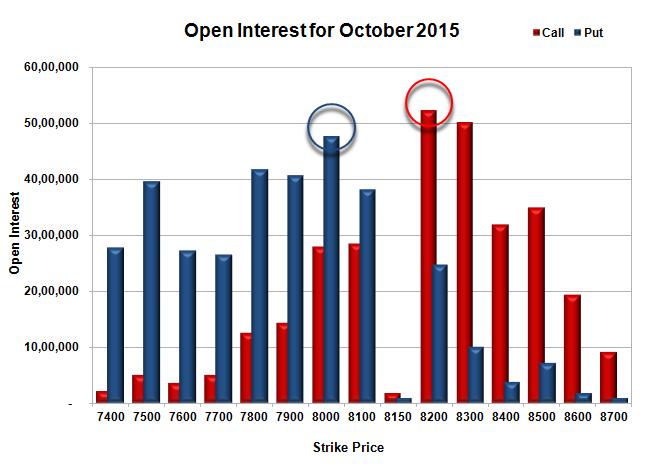 Initial and best support at 8200, with highest OI of 58.32 lacs and below that at 8100 with OI of 46.53 lacs. 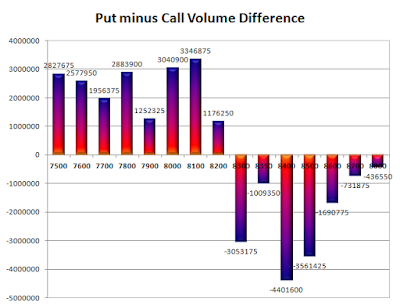 Initial and best resistance at 8300, with OI of 54.25 lacs and above that at 8400 with OI of 49.82 lacs. Day Range as per Option Table is 8211 - 8337 and as per VIX is 8186 - 8335 with 8283 as the Pivot. The Index opened gap-up above 8300 and stayed in a narrow range for the entire session oscillating around it, but closed just below at 8295.45, gain of 43.75 points. The broader market though was negative, with 659 advances to 856 declines. The range for the Expiry weeks comes at 8100-8400. 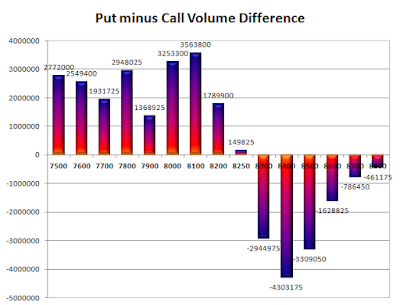 Call option 8350-8500 added huge 11.51 lacs OI with short covering seen at 8300 and below strike prices. Put option 8400-8300 added huge 12.33 lacs OI with profit booking seen at 8200 and below strike prices. Nifty Open Interest is at 1,85,27,025 down by 5,17,200, whereas Nov series added 13.59 lacs OI with increase in price, 100% roll-over with huge long build-up. Bank Nifty Open Interest is at 20,85,250 down by 1,99,700, whereas Nov series added 1.01 lacs OI with increase in price, mostly roll-over with huge short covering. FII’s bought huge 15.58 lacs Futures, which includes 36239 contracts long build-up and 26066 contracts short covering, with increase in net OI by 10173 contracts includes 132460 longs to 70155 shorts for the day. FII’s Index future open contract as on date is 620389 Longs to 390034 Shorts, Net Long 230355 up by huge 62305 contracts. Initial support at 8300, with huge OI addition of 8.24 lacs and below that at 8200 with OI of 54.07 lacs. 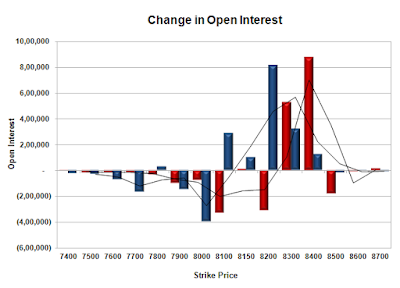 Initial resistance at 8400, with OI of 51.30 lacs and above that at 8500 with OI of 40.54 lacs. 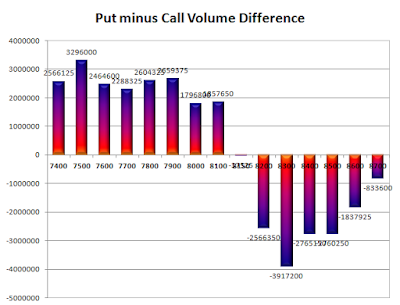 Day Range as per Option Table is 8234 - 8359 and as per VIX is 8225 - 8366 with 8301 as the Pivot. The Index opened flat but after making an initial high saw profit booking to end in red at 8251.70, loss of 9.95 points. The broader market was negative, with 674 advances to 843 declines. The range for the series has compressed to 8100-8300. Call option 8250 added 0.57 lacs OI with short covering seen at 8100 and below strike prices. Put option 8300-8100 added huge 15.48 lacs OI with profit booking seen at 8000 and below strike prices. Nifty Open Interest is at 1,90,44,225 down by 5,45,425, whereas Nov series added 4.34 lacs OI with decrease in price, mostly roll-over with small long liquidation. Bank Nifty Open Interest is at 22,84,950 down by 1,38,725, whereas Nov series added 0.47 lacs OI with decrease in price, small roll-over with huge long liquidation. FII’s bought 0.10 lacs Futures, which includes 481 contracts long build-up and 1496 contracts short covering, with decrease in net OI by 1015 contracts includes 62898 longs to 60921 shorts for the day. 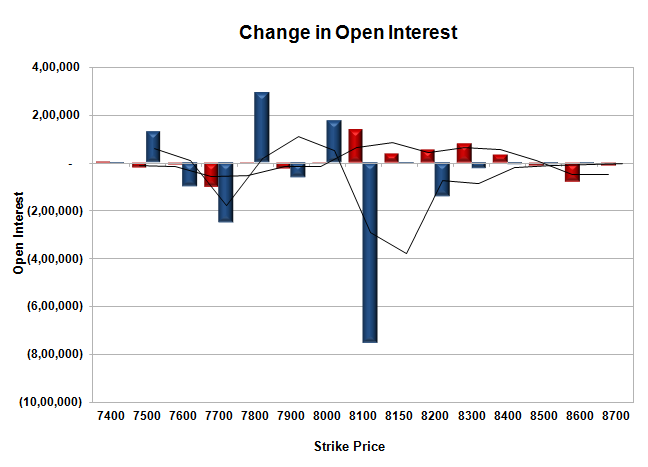 FII’s Index future open contract as on date is 584150 Longs to 416100 Shorts, Net Long 168050 up by 1977 contracts. Initial and best support at 8200, with OI of 56.10 lacs and below that at 8100 with OI of 49.44 lacs. 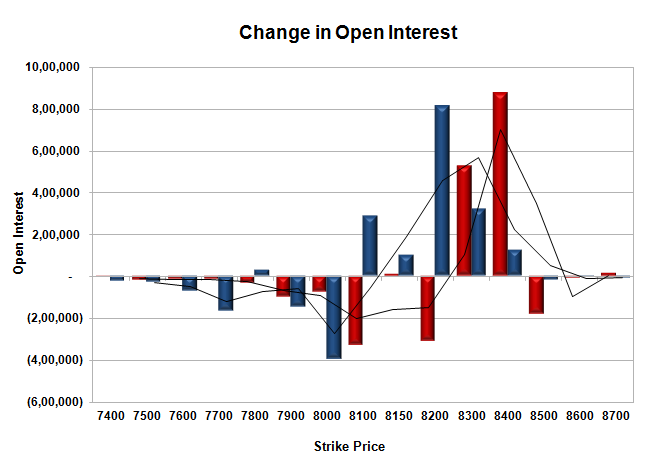 Initial and best resistance at 8300, with OI of 59.99 lacs and above that at 8400 with OI of 44.75 lacs. Day Range as per Option Table is 8182 - 8314 and as per VIX is 8180 - 8323 with 8254 as the Pivot. The Index opened flat to positive around 8280 and stayed in a narrow range and closed just weak at 8261.65, loss of 13.40 points. The broader market though was positive, with 827 advances to 708 declines. The range for the series stays at 8000-8300. Call option 8200-8300, 8500 added 7.16 lacs OI with short covering seen at 8100 and below strike prices. Put option 8300-8200, 8000 added 7.45 lacs OI with profit booking seen at 7900 and below strike prices. Nifty Open Interest is at 1,95,89,650 down by 3,44,625, whereas Nov series added 5.59 lacs OI with decrease in price, most probably 100% roll-over with small short build-up. Bank Nifty Open Interest is at 24,23,675 down by 30,800, whereas Nov series added 0.10 lacs OI with decrease in price, most probably small long liquidation. 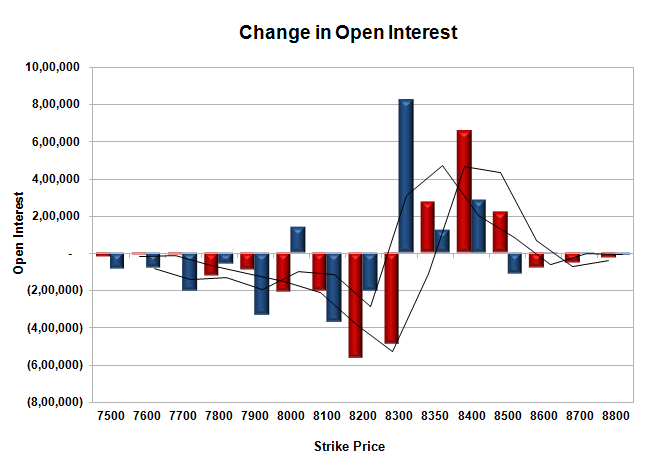 FII’s sold 3.10 lacs Futures, which includes 2605 contracts long liquidation and 9803 contracts short build-up, with increase in net OI by 7198 contracts includes 40392 longs to 52800 shorts for the day. FII’s Index future open contract as on date is 583669 Longs to 417596 Shorts, Net Long 166073 down by huge 25230 contracts. Initial support at 8200, with OI of 50.36 lacs and below that at 8100 with OI of 41.01 lacs. 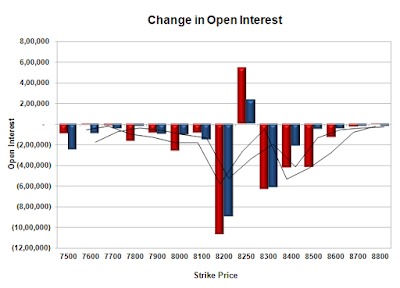 Initial and best resistance stays at 8300, with OI of 60.55 lacs and above that at 8400 with OI of 45.28 lacs. 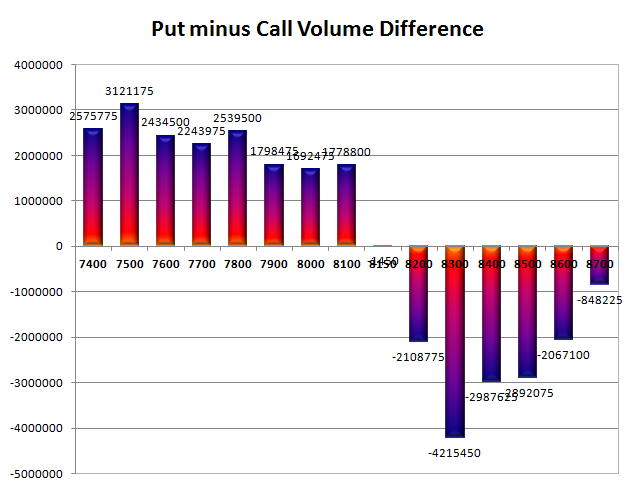 Day Range as per Option Table is 8198 - 8323 and as per VIX is 8188 - 8335 with 8262 as the Pivot. The Index opened positive and stayed strong with each dip being bought with ease and close near the highs of the day at 8275.05, gain of 36.90 points. The broader market was positive, with 858 advances to 658 declines. The range for the series stays at 8000-8300. 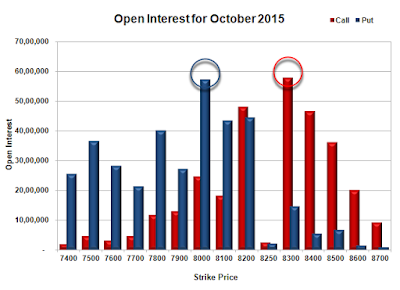 Call option 8200-8500 added 8.78 lacs OI with short covering seen at 8100 and below strike prices. Put option 8300-8200 added huge 12.07 lacs OI with profit booking seen at 7900 and below strike prices. 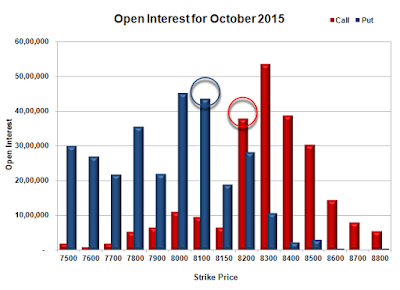 Nifty Open Interest is at 1,99,34,275 down by 3,90,100, with increase in price, most probably huge short covering. 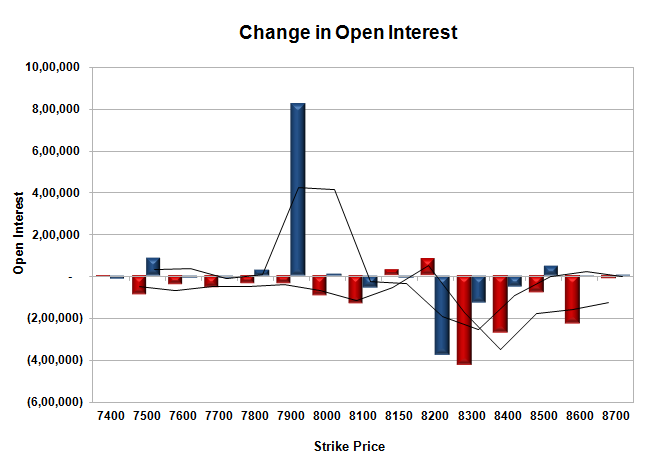 Bank Nifty Open Interest is at 24,54,475 up by 44,625, with decrease in price, most probably short build-up. FII’s sold 6.31 lacs Futures, which includes 10999 contracts long liquidation and 14231 contracts short build-up, with increase in net OI by 3232 contracts includes 36874 longs to 62104 shorts for the day. FII’s Index future open contract as on date is 586274 Longs to 407793 Shorts, Net Long 178481 down by huge 25230 contracts. 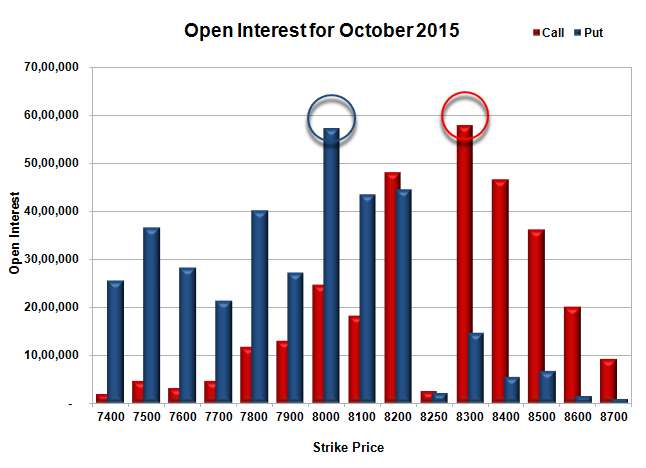 Initial support now at 8200, with OI of 44.54 lacs and below that at 8100 with OI of 43.53 lacs. 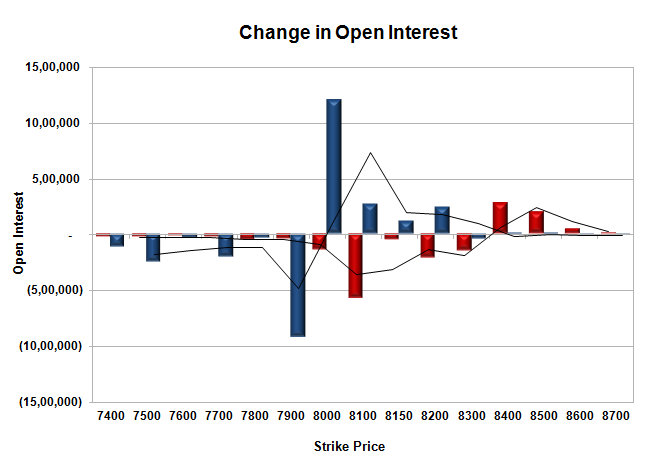 Initial and best resistance stays at 8300, with OI of 57.84 lacs and above that at 8400 with OI of 46.72 lacs. Day Range as per Option Table is 8202 - 8332 and as per VIX is 8202 - 8348 with 8266 as the Pivot. The Index opened flat to positive but went in red and stayed weak for the major part of the day, only to see huge buying interest in the last hour of trade to close above the psychological level of 8200 at 8238.15, gain of 58.65 points. The broader market was positive, with 768 advances to 744 declines. The range for the series stays at 8000-8300. 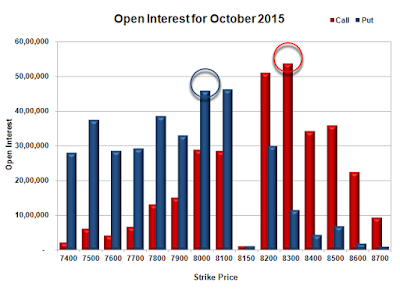 Call option 8300-8400 added huge 14.03 lacs OI with short covering seen at 8200 and below strike prices. Put option 8400-8100 added huge 16.48 lacs OI with profit booking seen at 8000 and below strike prices. Nifty Open Interest is at 2,03,24,375 up by 2,03,450, with increase in price, most probably huge long build-up. Bank Nifty Open Interest is at 24,09,850 up by 62,200, with increase in price, most probably long build-up. FII’s sold huge 13.19 lacs Futures, which includes 27521 contracts long liquidation and 25252 contracts short build-up, with decrease in net OI by 2269 contracts includes 36054 longs to 88827 shorts for the day. FII’s Index future open contract as on date is 597273 Longs to 393562 Shorts, Net Long 203711 down by huge 52773 contracts. 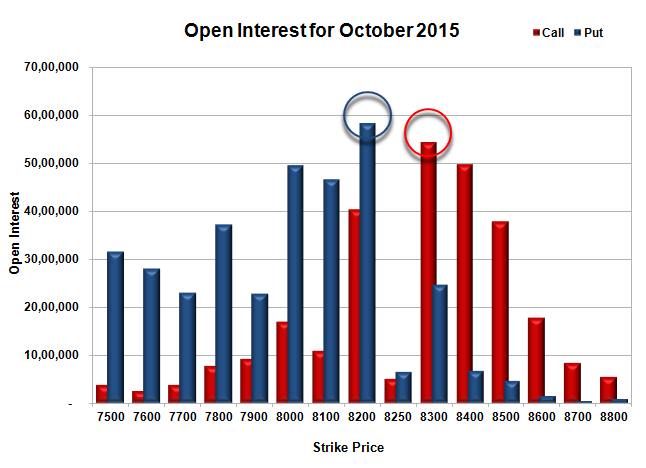 Initial support now at 8200, with huge OI addition of 8.14 lacs and below that at 8100 with OI of 43.81 lacs. Initial and best resistance at 8300, with OI of 53.98 lacs and above that at 8400 with OI of 43.54 lacs. 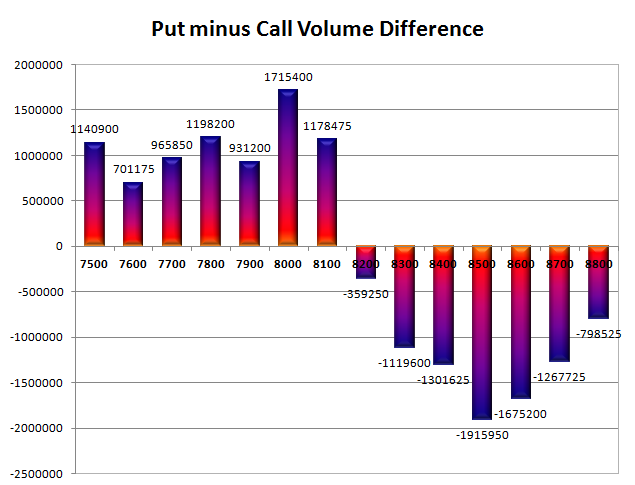 Day Range as per Option Table is 8148 - 8288 and as per VIX is 8168 - 8308 with 8211 as the Pivot. The Index opened positive around 8134 and stayed strong for the entire session of trade to close near the highs at 8179.50, gain of 71.60 points. The broader market was positive, with 866 advances to 655 declines. The range for the series has narrowed down to 8000-8300. 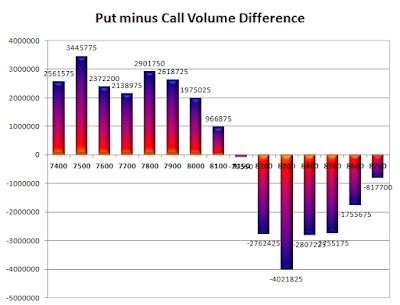 Call option 8400-8600 added 5.32 lacs OI with short covering seen at 8200 and below strike prices. Put option 8200-8000 added 18.49 lacs OI with profit booking seen at 7900 and below strike prices. Nifty Open Interest is at 2,01,20,925 up by 3,38,850, with increase in price, most probably huge long build-up. 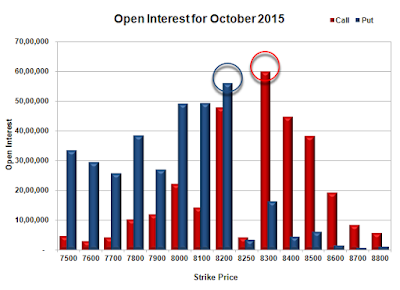 Bank Nifty Open Interest is at 23,47,650 up by 1,24,725, with increase in price, most probably huge long build-up. 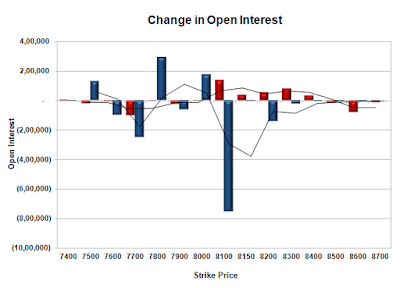 FII’s sold 1.57 lacs Futures, which includes 8166 contracts long build-up and 14448 contracts short build-up, with increase in net OI by 22614 contracts includes 69043 longs to 75325 shorts for the day. FII’s Index future open contract as on date is 624794 Longs to 368310 Shorts, Net Long 256484 down by 6282 contracts. 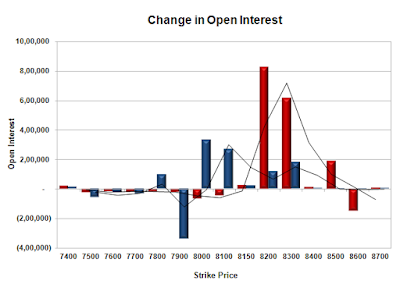 Initial support stays at 8100, with OI of 40.95 lacs and below that at 8000 with highest OI of 59.76 lacs. 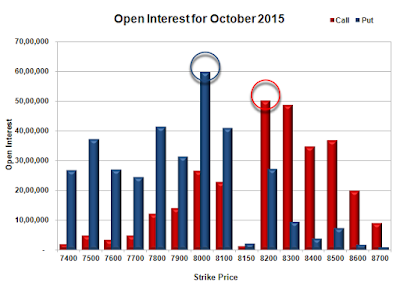 Initial and best resistance still at 8200, with OI of 50.17 lacs and above that at 8300 with OI of 48.73 lacs. Day Range as per Option Table is 8100 - 8239 and as per VIX is 8106 - 8253 with 8167 as the Pivot. The Index opened weak and stayed weak for the major part of the day, with all up moves being sold with ease. The index ultimately closed just above 8100 at 8107.90, loss of 23.80 points. The broader market though was positive, with 792 advances to 691 declines. The range for the series stays at 7800-8300. 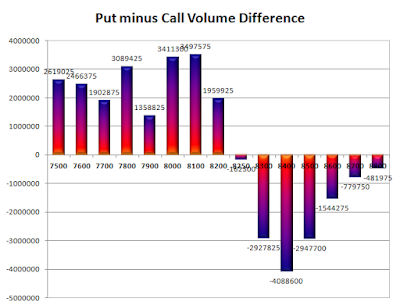 Call option 8100-8400 added 3.37 lacs OI with profit booking seen at 8500 and above strike prices. 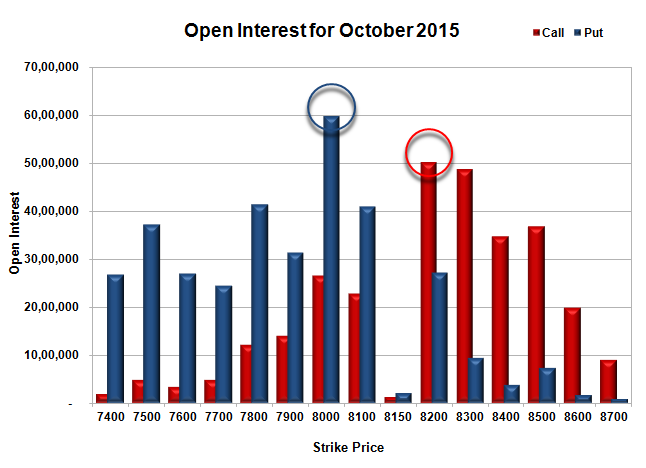 Put option 8000, 7800 added 4.66 lacs OI with short covering seen at 8100 and above strike prices. 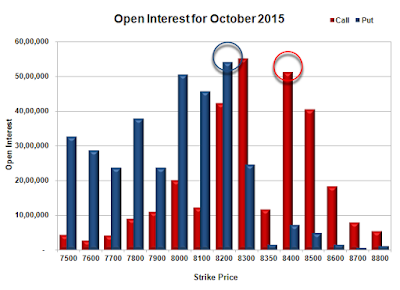 Nifty Open Interest is at 1,97,82,075 down by 13,04,900, with decrease in price, most probably huge long liquidation. 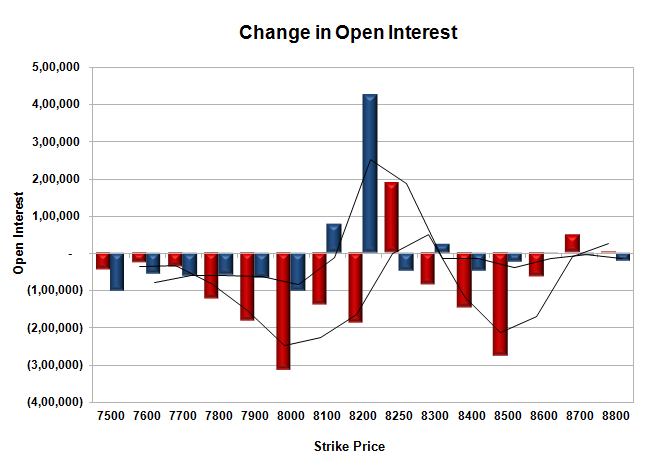 Bank Nifty Open Interest is at 22,22,925 up by 8,900, with decrease in price, most probably short build-up. FII’s sold huge 17.02 lacs Futures, which includes 45750 contracts long liquidation and 22320 contracts short build-up, with decrease in net OI by 23430 contracts (includes 53465 longs to 121535 shorts for the day) and the Average Price comes to 9042.52. FII’s Index future open contract as on date is 616628 Longs to 353862 Shorts, Net Long 262766 down by huge 68070 contracts. 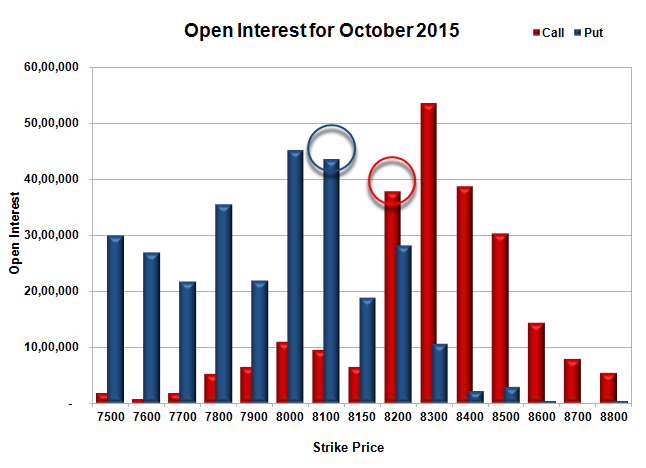 Initial support still at 8100, with OI of 38.21 lacs and below that at 8000 with OI of 47.70 lacs. 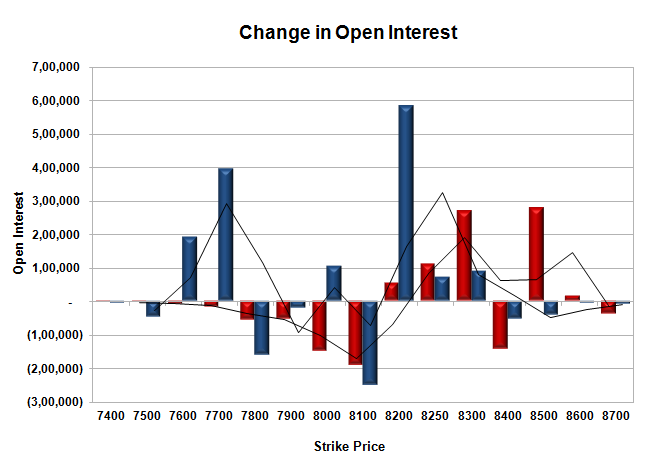 Initial and best resistance at 8200, with OI of 52.33 lacs and above that at 8300 with OI of 50.23 lacs. Day Range as per Option Table is 8041 - 8187 and as per VIX is 8033 - 8183 with 8115 as the Pivot. The Index opened negative and saw sell-off from the morning itself, with upmove sold with ease making a low below 8100, but closed nearly flat at 8131.70, loss of 11.90 points. The broader market though was positive, with 843 advances to 674 declines. The range for the series stays at 7800-8300. Call option 8150-8200 added 1.11 lacs OI with profit booking seen at 8300 and above strike prices. 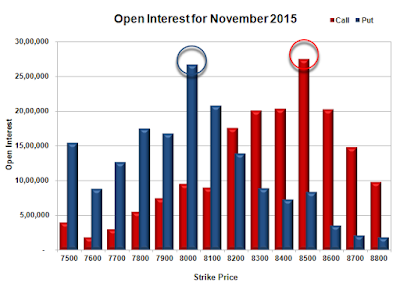 Put option 8000-7800 added 8.62 lacs OI with short covering seen at 8200 and above strike prices. 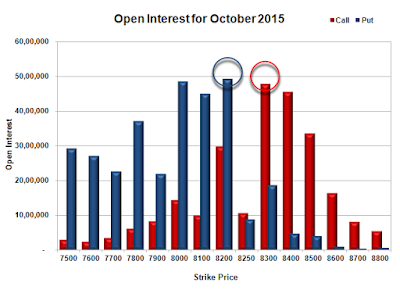 Nifty Open Interest is at 2,10,86,975 down by 7,58,350, with decrease in price, most probably huge long liquidation. Bank Nifty Open Interest is at 22,14,025 down by 25,275, with decrease in price, most probably long liquidation. FII’s sold 4.57 lacs Futures, which includes 24075 contracts long liquidation and 5807 contracts short covering, with decrease in net OI by 29882 contracts (includes 49687 longs to 67955 shorts for the day) and the Average Price comes to 8653.47. 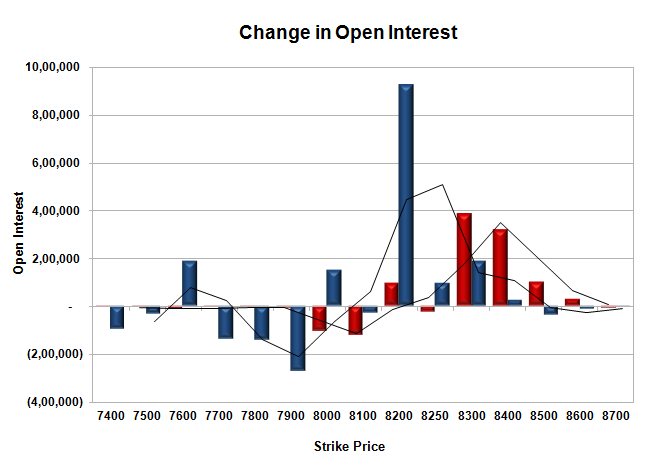 FII’s Index future open contract as on date is 662378 Longs to 331542 Shorts, Net Long 330836 down by 18268 contracts. 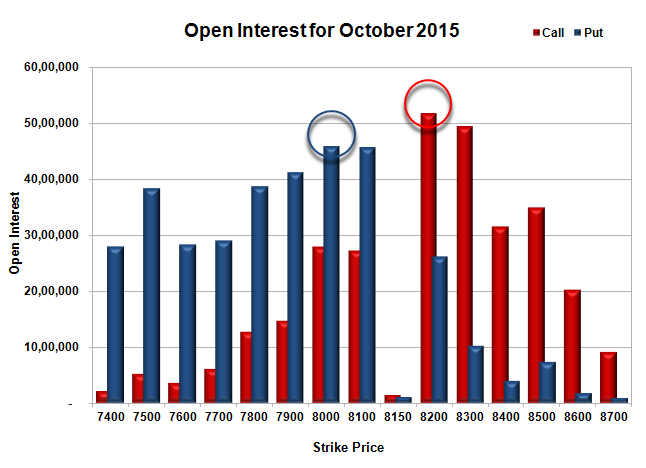 Initial support still at 8100, with OI of 45.76 lacs and below that at 8000 with OI of 45.95 lacs. Initial and best resistance at 8200, with OI of 51.80 lacs and above that at 8300 with OI of 49.45 lacs. Day Range as per Option Table is 8048 - 8203 and as per VIX is 8055 - 8208 with 8124 as the Pivot. The Index opened strong around 8231 and went up to touch the highs of the day at 8244. Profit booking from higher levels saw the index dip towards 8128 and closed weak at 8143.60, loss of 46.10 points. The broader market was negative, with 697 advances to 819 declines. The range for the series stays at 7800-8300. Call option 8200-8500 added huge 16.38 lacs OI with profit booking seen at 8600 strike price. Put option 8300-8000 added 9.18 lacs OI with profit booking seen at 7900 and below strike prices. Nifty Open Interest is at 2,18,45,325 up by 5,94,450, with decrease in price, most probably huge short build-up. 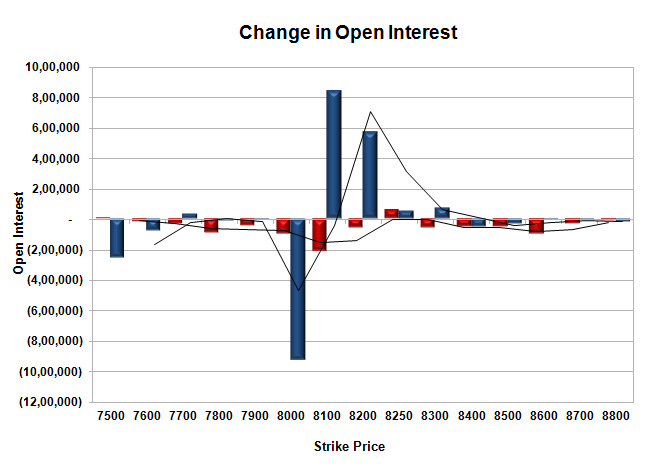 Bank Nifty Open Interest is at 22,39,300 up by 65,850, with decrease in price, most probably huge short build-up. 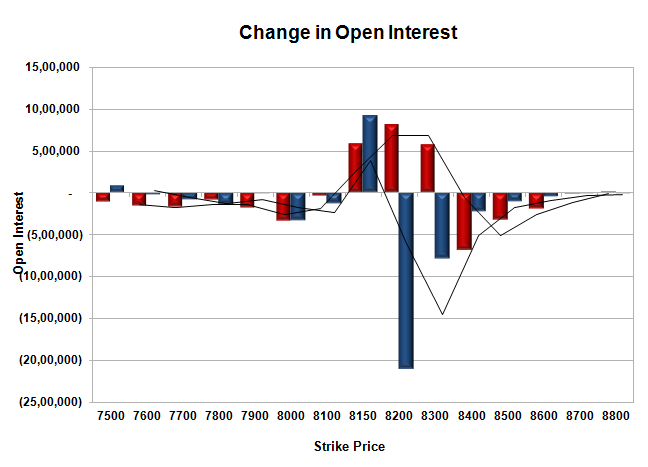 FII’s bought 8.77 lacs Futures, which includes 29794 contracts long build-up and 5281 contracts short covering, with increase in net OI by 24513 contracts (includes 70535 longs to 35460 shorts for the day) and the Average Price comes to 8533.35. FII’s Index future open contract as on date is 686453 Longs to 337349 Shorts, Net Long 349104 up by huge 35075 contracts. 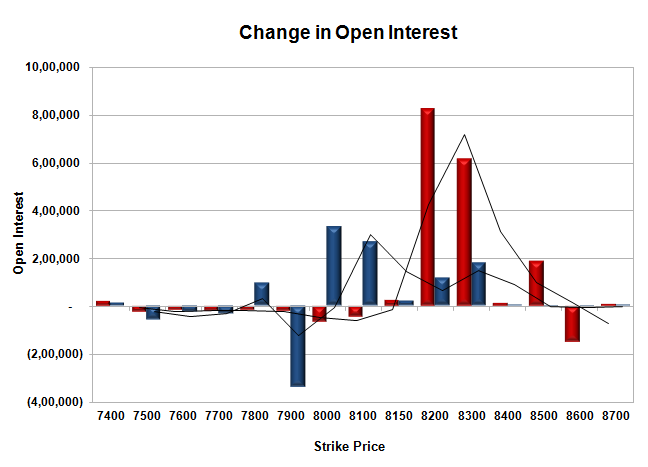 Initial and best support stays at 8100, with OI of 46.31 lacs and below that at 8000 with OI of 45.86 lacs. 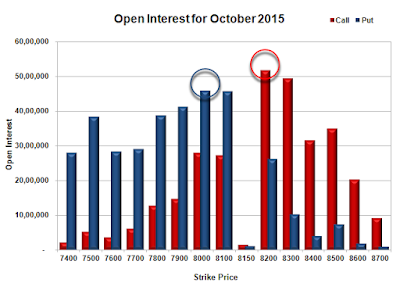 Initial resistance at 8200, with OI of 50.98 lacs and above that at 8300 with highest OI of 53.70 lacs. Day Range as per Option Table is 8082 - 8248 and as per VIX is 8062 - 8225 with 8172 as the Pivot.